what paper shouldi use to make this model?? How to provide support so that the model can bear its own weight? The model is designed with interior supports. It will bear its own weight if you print the template on card stock. It will not work with regular printer paper. The experienced papercrafters I know use either 110 gsm or 200 gsm card stock. 300 gsm may not fold as nicely as 110 or 200. Excuse me, I should have said 110 lb or 200 gsm cardstock. 110 lb and 200 gsm are roughly the same weight. I have completed construction the lower segment of the life size hulk paper model. Sorry. I am unable to help. 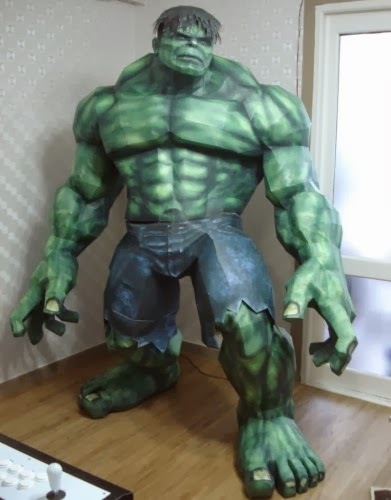 I am not the creator of the Hulk papercraft. You should contact Metal Heart at Paper Juke with any questions you may have. No password is required when opening the file with Pepakura Viewer. Do not use Pepakura Designer. olá esse projeto é magnifico, mas ele precisa senha para alterar as texturas, alguem sabe a senha? Try contacting the creator: PaperJuke. I think he has both a Google+ page and a Facebook page.